Facebook is a wonderous thing. Discovering online that we were both in New York, I had dinner with a friend from school who I had not seen since…well, we actually couldn’t remember the last time we’d seen each other. Some things never change, some things do, and we enjoyed a meal at M-Thai whilst discussing the pros and cons of the different paths we’d taken in life. For most of M-Thai’s meals, you have the vegetarian choices of mixed vegetables or tofu. I ordered the pad thai with mixed vegetables after double checking with the waitress that the sauce was made with tamarind (tamarind-less pad thai is one of my pet hates). I would have to say that our meals were delicious. 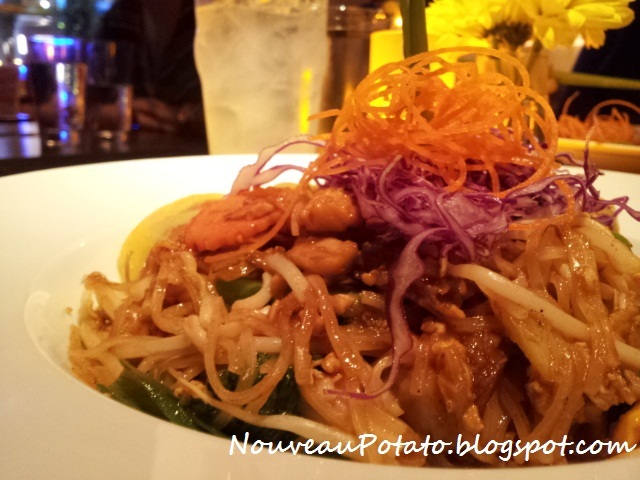 The pad thai arrived attractively garnished with red cabbage and curls of carrot. It was not heavily chillied but the other flavours made up for it (including a wedge of juicy lemon which I generously squirted over the noodles). To drink, I ordered the lychee lemonade, intrigued about what it would be. It was simply house-made lemonade with a canned lychee and lychee syrup added – very sweet. Considering we’d found M-Thai by asking Google for a Thai restaurant close to us, we were both quite proud of our choice. The food was not only reasonably priced (by New York standards) but also authentic and delicious.